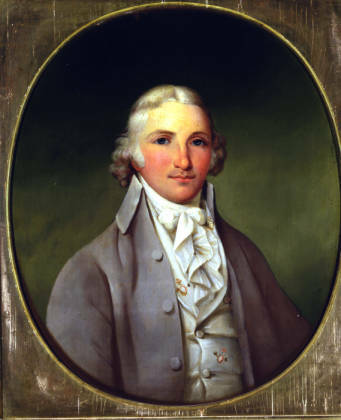 Portrait of Thomas Worthington as a young man, age 23, by N. Gwinn, ca. 1800. Worthington settled on a large estate in Chillicothe, Ohio that he called Adena. He served as one of the first United States Senators from Ohio and as Ohio's sixth governor. The painting is part of the fine art collection of the Ohio History Connection. The Democratic-Republican Party was one of the first two political parties in United States history. During the administration of President George Washington, Thomas Jefferson was the first secretary of state. Jefferson and several of his friends and associates became dissatisfied with the policies of the government. They formed a political association that came to be called the Democratic-Republican Party. Having just overthrown the King of England during the American Revolution, Democratic-Republicans feared a strong national government. They believed that the Constitution was a "strict" document that clearly limited the powers of the federal government. Unlike the opposition Federalist Party, the Democratic-Republican Party contended that government did not have the right to adopt additional powers to fulfill its duties under the Constitution. Democratic-Republicans favored keeping the U.S. economy based on agriculture and said that the U.S. should serve as the agricultural provider for the rest of the world. If the United States produced a surplus, they could sell the extra crops overseas and use the money from these sales to buy manufactured goods from Europe's industrialized nations. The Democratic-Republicans were somewhat more egalitarian than the Federalists were. Jefferson said that all adult white men should have the right to vote and serve in elected office as long as they owned a minimal amount of property. The Democratic-Republicans wanted all U.S. families to own their own farm. Jefferson also believed that working-class people would put aside their own personal gain for the public good if they owned enough property to feed and house their families. The Democratic-Republican Party often aligned itself politically with France, whose citizens followed the example of the United States in the late 1780s with a revolution of its own. Economically, the Democratic-Republicans wanted to remain a predominantly agricultural nation, very different from either England or France during this time. Three Democratic-Republicans, Thomas Jefferson, James Madison, and James Monroe, became presidents of the United States. The Democratic-Republican Party ceased to exist in the mid-1820s as new political parties emerged to replace it. The Democratic-Republican Party was the dominant political party in the early years of Ohio's statehood. This is evident in the Ohio Constitution of 1803, which established a relatively weak government, with the legislative branch holding most of the power. Most of Ohio's earliest political officials were Democratic-Republicans, including Thomas Worthington, one of Ohio's first two United States senators.